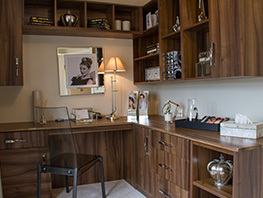 A wide range of inspiring designs for traditional and modern furniture which provide beautifully practical storage solutions for your home study and bedrooms. Whether you are buying a new home or are looking for furniture for your current home, Albert Henry Interiors have the perfect choices for you. Crafted to the highest standard, individually hand-made using different materials and a wide range of finishes in the most creative way possible. 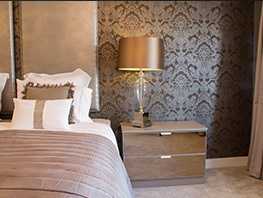 Albert Henry Interiors offers a perfectly tailored look to reflect your style. 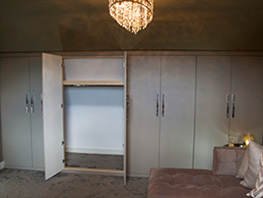 Bespoke fitted wardrobes & built-in furniture. Helping you to achieve the maximum usable storage in rooms with awkward spaces. One of the most sensible solutions to storage, they take up no extra space, offer unrestricted access and create an incredible amount of useful space. Create the perfect space to work at home. A productive environment tailored to your working needs, with cleverly integrated storage solutions. You can view the quality of our craftsmanship first hand by visiting a Davidsons show home close to you, or take a 360 tour right now to view our work. Why choose Albert Henry Interiors? Whether you are buying a new home or are looking for furniture for your current home, Albert Henry Interiors have the perfect choices for you. Albert Henry Interiors is a supplier of exclusive designed fitted furniture for executive homes built by the UK’s leading house builders. Based in Ibstock, Leicestershire, we have established a reputation for designing stylish solutions. 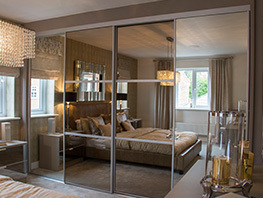 Transforming bedrooms and home studies to sumptuous living areas with unimaginable storage.